Star Blazers: Odyssey of the Celestial Ark, known in Japan as Space Battleship Yamato 2199: Odyssey of the Celestial Ark (宇宙戦艦ヤマト2199 星巡る方舟, Uchū Senkan Yamato 2199: Hoshi-Meguru Hakobune), is a 2014 film based on the Space Battleship Yamato 2199 anime series. The movie is set during the events of the series, primarily as the eponymous spaceship Yamato makes its way back to Earth after a long voyage to the planet Iscandar. Prior to advertising of the home video release of the movie, writers had used the English translations Space Battleship Yamato 2199: Star-Voyaging Ark and Space Battleship Yamato 2199: Ark of the Stars. Home video packaging announced in April 2015 revealed Xebec's choice of Space Battleship Yamato 2199: Odyssey of the Celestial Ark as the official English title. The film grossed ¥68.8 million at the Japanese box office in its first week of release. Writing for the Kotaku blog, reviewer Richard Eisenbeis generally praised the movie, particularly the debut of Gatlantis as a potent threat, the portrayal of the Garmillon characters, the focus on two Yamato crew members who had received only minimal attention in the Yamato 2199 series, and Kodai's growth as a leader. However, the reviewer was less impressed with what felt "more like the first arc of a new series" rather than a completely self-contained story. ^ a b "Yamato 2199 Films' Trailer, Teaser, Story Outline Unveiled". Anime News Network. ^ Richard Eisenbeis (12 December 2014). 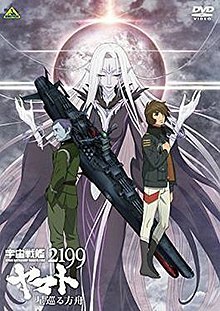 "Yamato 2199's Movie Feels like a Second Season Pilot." Kotaku. Retrieved 20 July 2015.